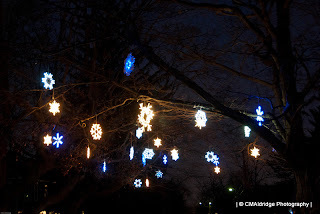 As 2011 comes to a close I wanted to share some holiday light photos I took last week on Christmas Eve, uh, Eve (Dec 23rd). I was surprised how sporadic Christmas light displays were. 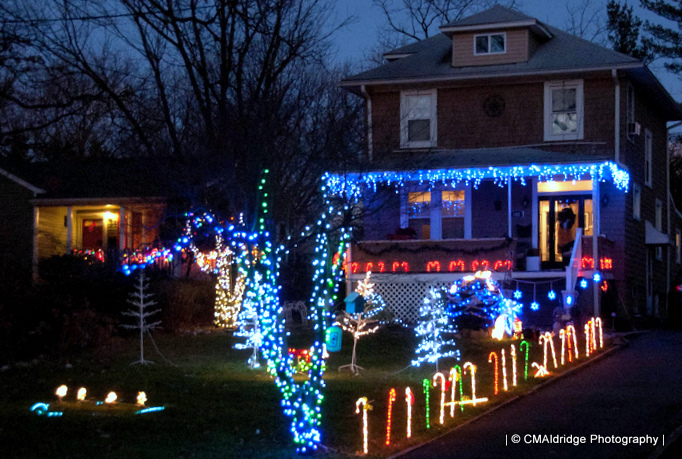 I was looking for a house that was well defined by it's lighting, though not necessarily with the Clark Griswald lighting design method. This proved to be much tougher than I thought! 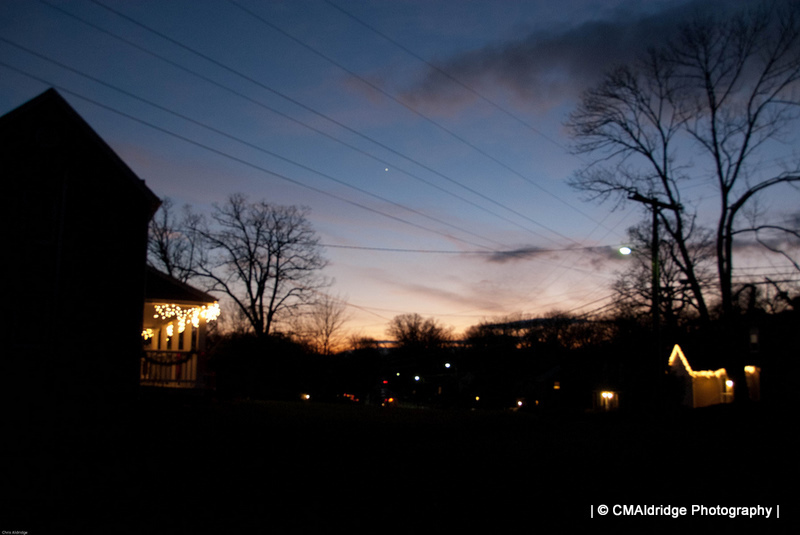 I set out before sundown to try and get a house framed by a backlit sky. Right before there was no light left, I got this keeper! Hit the break to see some more from that night! 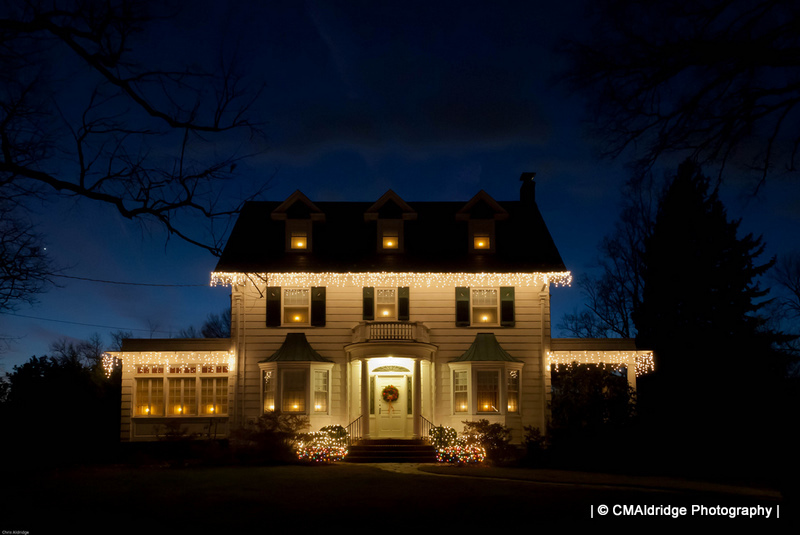 This white colonial style house wasn't enblazened with lights on all edges, but was lit to where you could make out its overall shape. Really it was very simply lit, with icicle lights along the eaves of the main house and the sun room and side porch. Candle lights in the windows added a nice glow, and the lights on the bushes framing the door steps added a bit of color. This was a tough exposure to make. I braced my D200 on the truck I was riding in, locked the mirror up and took a couple of .8 sec exposures. I did do a little correcting of the lens distortions and tilt, but otherwise this is pretty much how it came out! 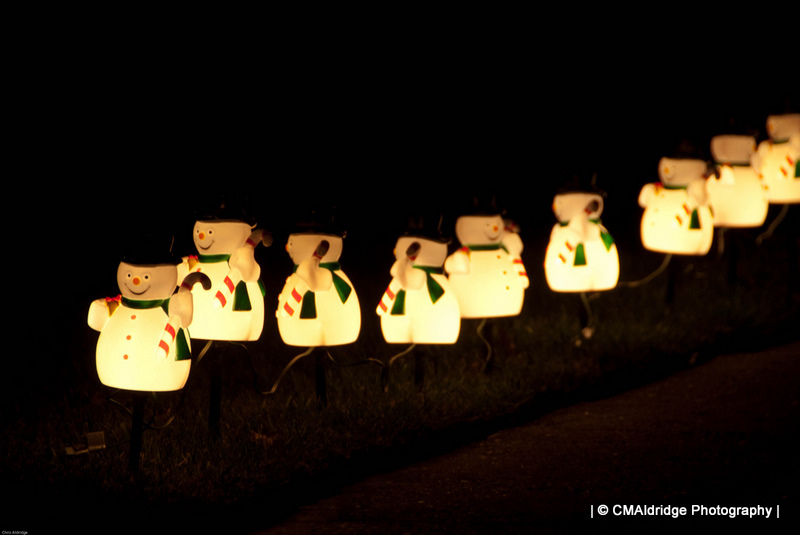 My co-hunter and I got a kick out of these snowman luminaries along a front walkway. The somewhat random way in which they were aligned gives the impression of these happy go lucky wintry walkers ambling along in a cartoon-ish fashion. Perhaps to take their candy canes to a Christmas Party! We saw this house from two streets over and braved hills and rivers to find our way over to it! Well, maybe a couple of twisty streets. I think this was the most lit display we saw in that area. I have to admit, this was the first house I photographed that night, and I felt a little weird at first jumping out of the car and snapping frames. But who could be mad at you oogling their display so much you want to have a picture to remember it later? I had been really worried that our planned outing wasn't going to happen since it had been raining and cloudy during the day. Fortunately the sky cleared up nicely and offered a great sunset. 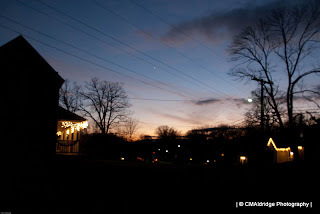 In fact, I've noticed that we've had a lot of great sunsets this fall and winter. I haven't paid enough attention to know if there is something cosmic or atmospheric contributing to it or not. These snowflakes were hung out over the street from tree limbs. At first I thought they were battery operated, but sure enough they were all plugged in! Hopefully this won't be the only snow I see this year! 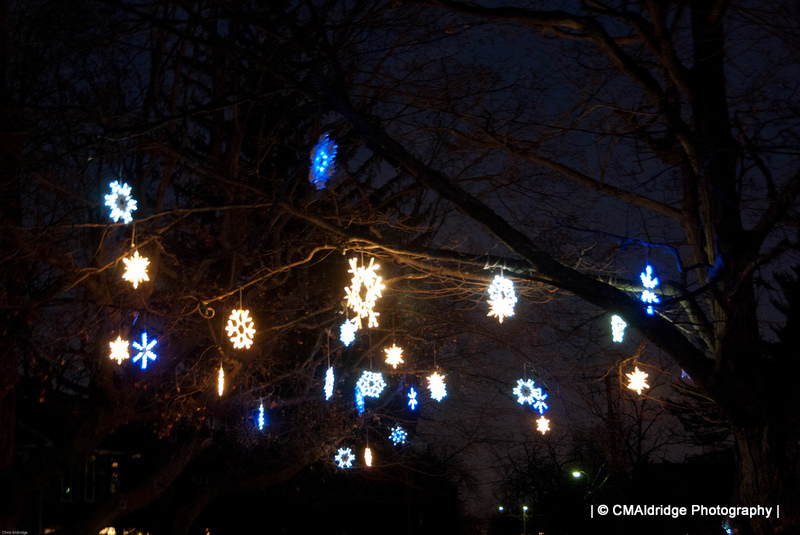 Have a Happy New Year Eve and a great 2012!